Is the Birch Egg the Fabergé Easter Egg thought to have been in production for 1917? According to various sources on the internet, it is, but there are rumours that as many in the Fabergé world think this is a clever modern Egg. Judge for yourself! On this page I gathered information about this Egg. For the websites I used, please see sources at the bottom of this page and read Mieks disclaimer! "The Birch Egg, also known as Karelian Birch Egg, is made of gold and Karelian Birch. The now missi ng miniature was possibly a miniature elephant, made of gold, silver, rose-cut diamonds and enamel. Karelian birch is a sort of birch that only grows in Russia, on Michael Perkhin's (the designer) native land, Karelia. Karelia is situated between St. Petersburg and Finland. The now lost surprise was a miniature elephant, decorated with gold and silver, 8 big and 61 small diamonds. It probably referred to the elephant of the Danish Order of the Elephant, Denmark being the country where Maria Feodorovna was born. The key to wind the elephant exists and is made of gold, set with diamonds". This Egg was purchased by the privately owned Russian National Museum (a group of Russian collectors) and had not been exhibited on its native soil since 1927. The Museum purchased the Egg after it emerged from nearly 85 years of obscurity in 2001. Alexander Ivanov, the director of the Museum, declined to name the Egg's previous owner, who he said lives in London and is descended from a family of Russian emigres, saying only that the Egg cost the museum "millions of dollars". 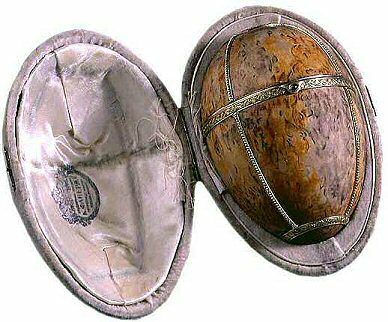 The Egg came with the key, the case and two documents, the socalled authentic calculation of the firm Fabergé dated April 25, 1917. 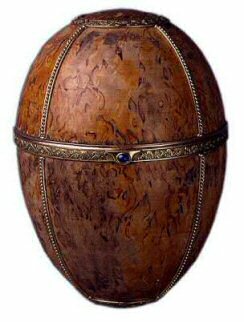 The sum is a heft one, considering the Egg is made of karelian birch rather than the usual gold and precious gems that made Fabergé famous. 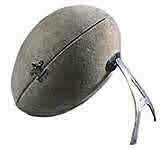 Ivanov said it is the Egg's history, rather than its physical composition, that makes it so valuable. 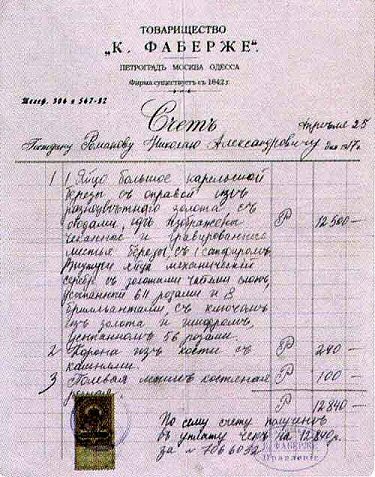 Its purchase included the transfer of all of the Egg's original documentation, including the invoice from its sale and a letter from Fabergé to transitional government head Alexander Kerensky. "The letter alone could cost $100,000 because it is an original historical document," Ivanov said. In the letter, Fabergé complains about having not been paid and asks Kerensky to send the Egg to Nicholas II. The Rumyantsevsky Museum (now the Lenin Library) acquired the Egg after the October Revolution. In January 1927, the museum closed and 450 items - including the Birch Egg, were sold by the Soviet government to foreign buyers. Experts can only speculate about the Egg's whereabouts before it surfaced in London. In 1999, the publication of drawings from the Wigström workshops alerted scholars to the fact that two Eggs were designed for delivery in 1917. One, the "Blue Tsarevich Constellation Egg" in the form of a celestial globe bearing the constellations present on the birth of the Tsarevich Alexei, and the other, "The Birch Egg" crafted of Karelian Birch panels set in gold. Expert Tatiana Fabergé released images of the drawings for these pieces, but, it was believed, the pieces were never finished. Have two new Imperial Fabergé eggs surfaced in Russia?